Well, Collected Sounds has a bit of a history with Ms Slean. She was one of the first artists we ever spotlighted, the third CD we ever reviewed, and she was our first house concert. So I have a special place in my heart for her. 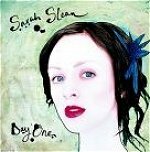 This is Sarah’s third release, well, if you don’t count EPs and such. Her last release, “Night Bugs” got some flack from previous Sleansters saying she’d adopted the stylings of a “drunk cabaret singer”. I personally thought she was just trying to break out of The Tori Mold. Admittedly, her first couple releases were very similar to Tori Amos’ music, so I am not surprised she broke out a little. I for one loved it. I thought it was fun and theatrical and just plain cool. Well, on this release she’s sobered up a little and has put out another incredible record. Her great piano chops show well, as does her interesting and unique voice. She sounds nothing like Tori anymore. She’s grown in to her own. “Lucky Me” is a fabulous song to sing in the car at the top of your lungs. It makes you want to move however. You might have to pull over to dance. The title track, “Day One” is another good sing-along anthem-ish sound. “Out in the Park” is reminiscent of her previous “Duncan”, quite theatrical. Very lovely. It’s also nice to see she hasn’t lost her knack for the lyric. I haven’t listened enough to say I understand everything she’s trying to say, but it’s poetic and lovely and I want to figure out every word. If you have ever considered getting one of her CDs, now is the time. If you’ve never heard of her, and you like piano rock you owe it to yourself to check her out. Comment: Damn she is good, I love her style, Lucky me is a lyrical crack up and a nice chunky choppy rhythm guitar, Kate Bush vibes. Very fresh sounding. 5 stars!!! Comment: This is one of my favourites from last year. Sarah is growing as an artist with each record.